After we shared a list of the reasons we are grateful this year, and asked our members and supporters to do the same. The responses have touched us and filled us with hope. 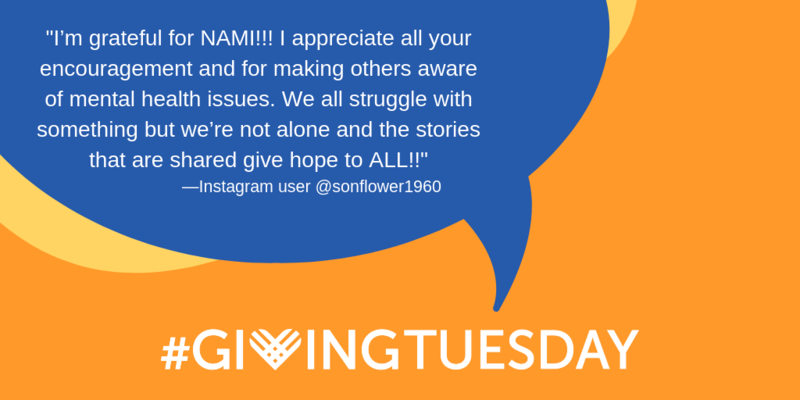 As this is #GivingTuesday and it is the season of giving, we are asking you to consider support for NAMI Westside Los Angeles. One in five Americans lives with a mental health condition. Your contributions can make a difference by providing support, education and advocacy for our community. If you are not yet a member, please consider membership. If you’re already a member, consider gifting membership to another loved one, or consider a one-time donation to NAMI Westside LA. Our membership funds and donations are used to support the free services we provide year-round. We rely on these funds to help us work on services to benefit the participants in NAMI Westside LA’s programs, from our classes and groups for those affected by mental illness, to our school programs and outreach efforts in the community. You can be assured that each donation will make a difference. ← We Asked, You Answered: What Are You Grateful For?